The holiday weekend passed without a single motor vehicle death, a rarity for our often rainy and treacherous roads (the Arcata California Highway Patrol office did report nine DUI arrests and five total crashes). 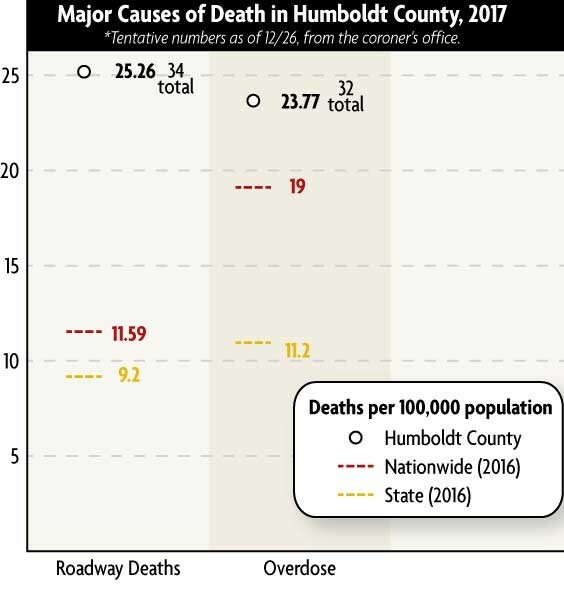 But Humboldt County still exceeds the national average on two tragic statistics: Motor vehicle deaths and accidental overdoses. As the Journal went to press on Tuesday, Dec. 26, the coroner’s log for the year included a total of 34 deaths related to motor vehicle accidents. Astute readers will note that this is three more than the Journal estimated on Dec. 14, when we reported that Dwight “Dirty Dave” Davis, a beloved member of the local biker scene, was struck by an allegedly drunk driver while crossing West Harris Street on foot, making him what we thought was the 31st roadway death of the year. There are a few reasons for this discrepancy: The coroner will occasionally record deaths of people we don’t get press releases about, or record deaths for people who don’t die immediately on scene, but pass away later, such as Lee Price, whose vehicle struck a tree on Oct. 15, but only died from his injuries on Nov. 16. Ultimately, with six days left in a very grim year, we totaled 34, three more than the 2012 record of 31. Why? Paul Craft, public information officer for the California Highway Patrol’s Arcata station, believes that last year’s very wet weather may have been a contributing factor. About a third of all the fatalities were cases of pedestrians hit by vehicles. 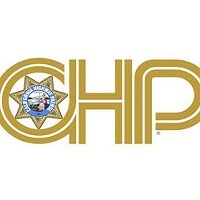 At least two in Southern Humboldt reportedly involved a person running in front of a moving vehicle on U.S. Highway 101. There were also several people struck while crossing Broadway in Eureka and two cases where motorcyclists were struck by cars. In a Sept. 2015 cover story about our unusually high rate of of road deaths, Chief Deputy Coroner Ernie Stewart cited alcohol and other drugs as one major factor in this problem, which only seems to be increasing. According to statistics from 2016, our total this year for per capita motor vehicle deaths is about three times both the nation and statewide averages. 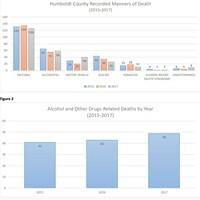 The impact of alcohol and other drugs reverberates on other deaths in our county as well, with accidental overdoses taking 32 Humboldt residents in 2017. The majority of these, according to notes from the coroner’s office, were from either methamphetamine or opiate intoxication, with a spike in August and September, around the same time the Humboldt Area Center for Harm Reduction reported that a batch of fentanyl-laced methamphetamine was going around. 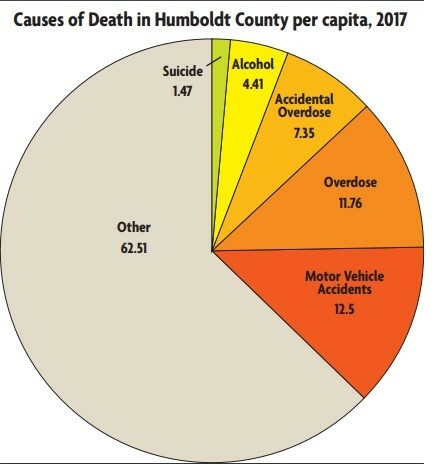 All in all, in 2017 Humboldt County recorded three times the state average for per capita overdoses, and almost twice the national average. Editor's Note: A prior version of this story included a graph that contained incorrect numbers. They have been corrected. The Journal regrets the error.